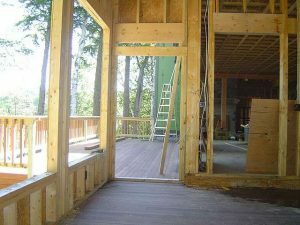 An OSB or plywood subfloor can quickly become damaged if it becomes exposed to water. Water can easily cause a plywood subfloor to rot, warp or become punky. In addition, a damaged plywood subfloor can begin to squeak and buckle the finished flooring. Fortunately the effort and tools required to repair plywood subfloors is easy to do, albeit you will first need to lift up the finished flooring material. To repair a plywood subfloor you will need a skill saw, chalk/pencil, square, tape measure, safety glasses, pry bar, hammer, screw gun, caulking gun, and a ¾” drill bit. First lift up the finished flooring material and locate the damaged OSB or plywood subfloor areas. Make a large X over them with a piece of chalk or pencil. Next, determine where the floor joists are and use your chalk or pencil and the square to mark out square sections that encompass the damaged plywood subfloor areas. Make sure your marks that are parallel to floor joists line up directly over the centerline of floor joists. Use the pry bar and hammer to remove nails in the damaged plywood subfloor areas. Next, use a screw gun with a ¾” bit to drill a test hole into the subfloor, over one of the damaged areas, to determine the thickness of the subfloor. After determining the thickness of the subfloor set the skill saw blade height to the measured thickness. Use your circular skill saw to cut out the damaged plywood subfloor pieces as marked. To complete the OSB or plywood subfloor repair, visit your local home improvement center and pick up the necessary sheets of 4’x8’ pieces of plywood or OSB. In addition, pick up some 1-1/2” or 1-5/8” coarse threaded drywall screws and an adhesive such as Liquid Nails. Cut the new OSB or plywood sheets to the appropriate dimensions of the wholes you cut out in the subfloor. Apply a thick bead of adhesive over each exposed floor joist and then lay the cut pieces of new plywood subfloor material over the cut out openings. Use the drywall screws and a screw gun to secure the new plywood pieces to the repaired subfloor. Make sure the drywall screws screw into the floor joists for proper fastening. After completing the plywood subfloor repair you can then reinstall the finished floor material.